WASHINGTON — A federal court on Tuesday dismissed a lawsuit by the nation’s largest coal companies and 14 coal-producing states that sought to block one of President Obama’s signature climate change policies. The lawsuit, Murray Energy v. E.P.A., challenged the Environmental Protection Agency’s proposed rule to reduce planet-warming greenhouse gas emissions from power plants. If enacted, the rule could shutter hundreds of such plants, freeze construction of future plants and slow demand for coal production in the United States. The lawsuit was the first in a wave of expected legal challenges to the E.P.A. climate change rules. Legal experts say they expect some of those challenges to make it to the Supreme Court. Among the lawyers arguing on behalf of the coal companies was Laurence H. Tribe, a renowned Harvard scholar of constitutional law and Mr. Obama’s former law school mentor. The E.P.A. put forth the power plants proposal last June, and after taking public comments and revising the plan, the agency is scheduled to reveal it in final form in August. The judges in the United States Court of Appeals for the District of Columbia Circuit rejected the challenge, saying it was unprecedented for a court to review a rule that had been introduced only in the form of a draft. All three circuit court judges agreed that the challenge was premature. Environmentalists also cheered the decision. “The first legal challenge to the Clean Power Plan failed today, and others the polluters will trot out should fail as well,” said David Doniger, the head of the climate and clean air program for the Natural Resources Defense Council, an advocacy group. But litigants are already preparing to file a new suit once the rule is put into effect. Legal experts on both sides of the issue say the final regulation is expected to stand as a novel and even audacious legal interpretation of the 1970 Clean Air Act. Under standard Clean Air Act regulations, the E.P.A. assigns emissions limits to polluting entities such as power plants and dictates how companies will meet the limits — for example, by installing pollution-reduction equipment, like chemical scrubbers, in power plant smokestacks. The agency has taken a unique approach with the climate change rule, however. It is expected to assign each state a different target number for reducing its levels of greenhouse gas emissions, though states will be able to create their own plans for doing so. Those plans may range far outside the power plant fence with states complying, for example, by increasing their production of renewable energy from wind and solar, by installing energy-efficiency technology, or even by enacting a carbon tax. The E.P.A. contends that the broad approach will give states the flexibility to customize an emissions reduction plan that best suits their energy profile. But that broad interpretation of the Clean Air Act could also create legal vulnerabilities in the plan. Letters Of Credit: What’s The Difference Between One Inch And One Foot? Banks are often accused of being nit-picky and overzealous when they examine documents against a letter of credit. It seems they want every “t” crossed and every “i” dotted. Would you believe one exporter did not get paid because of a simple apostrophe? The United States remains one of the few countries that employs the imperial measurement system. As if that doesn’t generate enough confusion, it becomes even worse when Americans use abbreviations, which make no logical sense to the rest of the world. HOW BIG WAS THAT T.V.? The merchandise description in one letter of credit stated, “Shipment of TV sets with 24” screens.” The description on the invoice presented stated, “Shipment of TV sets with 24’ screens,” and the bank rejected the documents because of this discrepancy. In the United States an apostrophe and quotation marks have different meanings when used to signify a unit of measure. An apostrophe designates feet. Quotation marks designate inches. In an earlier blog, we related the story of Holstein cows, 24 months pregnant. The use of a dash makes a significant difference between 24 months and 2-4 months. Is a bank too nick-picky to note these discrepancies? Probably not, because of the implications. The burden of accuracy falls on the preparer of the documents. Before they are sent to the bank for examination, the preparer must understand and follow the requirements of the letter of credit as well as the rules stipulated in the UCP 600. Mary Meeker, a partner at the prestigious venture capital firm Kleiner Perkins Caufield & Byers, has just released her annual Internet Trends report. Meeker is uniquely qualified as she's been an internet analyst for a rather long time. In fact, this week's 2015 Internet Trend Report is her 20th edition. Such experience and the consistent high quality must be why audiences at this week's Code Conference (and millions of others) were so eager to see what she had to present this year. As the internet itself is a broad topic, Meeker covers a wider variety of issues in her reports. Some are clearly obvious, while many have not been presented so clearly. To start off, it's important to realize there are now 2.8 billion internet users around the world -- which is up 8% from last year. In short, mobile growth has exploded and it's increasingly how people access the internet. From the Advertising perspective, mobile is under-indexed and poised to grow the most. It will be interesting to see what happens in the ~$25B+ mobile marketing arena. I'm sure we'll see the obvious contenders such as Facebook, Google and Snapchat, though something new could always come out of left field and dominate this space. Check out the full presentation here on SlideShare. An importer requested a bank to issue a letter of credit for ladies fashion dresses from Italy. When the importer completed the application for the letter of credit, he indicated the tenor of the drafts at 180 days sight with discount charges for the applicant. Additionally, the letter of credit was issued as a revolving letter of credit with the balance reinstated on the first day of each month until the letter of credit expired six months later. This allowed the beneficiary to make shipments each month equal to the amount of the letter of credit. This arrangement permitted the bank to make payment to the supplier in Italy upon receipt of the required shipping documents. The bank would then delay payment to the buyer for 180 days and the buyer agreed to pay for the cost of interest during the 180 days period. Initially, everything went as planned. The bank received documents and found them in compliance with the terms of letter of credit. They remitted the payment to Italy, created a “Banker's Acceptance” for 180 days, and charged the cost of financing to the buyer. The bank released the documents so the buyer could clear the goods through customs, sell the dresses and collect the money before the due date of the draft. The bank waited for the clock to wind down to the payment date, 180 days later. And wait they did. On the 180th day, when the bank requested payment from the buyer, they learned the buyer could not pay. The buyer informed the bank that he was preparing to file for bankruptcy and the unsold dresses were in a warehouse. Since the bank had a lien on the assets of the company, the bank’s lending officer began arrangements to seize them. Unfortunately, the only assets available were the ladies fashion dresses, now 180 days old and no longer in season. The bank’s loss increased exponentially because by the time they realized they had a problem with the shipment made in the first month, they had already obligated themselves for shipments made the subsequent five months. The bank ultimately sold the dresses. The recovery of funds amounted to less than 50% of the bank’s loan and they took a loss for the balance of the unpaid loan. While letters of credit seem self-liquidating and self-securing because of the underlying transactions, banks need to cautiously ascertain the value of goods and determine if they can be readily liquidated, or face the resulting consequences as illustrated in this lesson. Once it becomes known that a bank has distressed merchandise, the value of the merchandise drops significantly. Bankers, who do not have expertise in selling merchandise, eagerly find a buyer as quickly as possible even if it results in a loss. This lesson illustrates why banks should be very cautious when issuing letters of credit; It carries the same risk as when a customer applies for a loan. Usually banks prefer not to rely on the underlying transaction as collateral. They typically will want some other collateral as well and often will require the applicant to secure the letter of credit with cash in an account at the bank. The most common ways we refer to people at work are possibly the most destructive business terms ever devised. It's time to purge them from our terminology. A few years ago, Bob Chapman, CEO of Barry Wehmiller, asked a military general,"How do you train or condition people to kill other people?" His answer was, "We don't. We teach them to take out targets that make bad decisions." Chapman went on to rightly observe, "The military uses language to dehumanize the taking of lives. We do the same thing in business." When we refer to people as "head count", "human capital", and a "human resource" we unintentionally dehumanize them as well. In his 1909 groundbreaking paper titled, "The Principles of Scientific Management" Frederick Taylor developed the idea of "task allocation", which broke work down into the simplest, most mundane tasks ("put this nut on that bolt"). This intentionally took all the thinking out of work, turned it into a rote "task", and in the process, fully dehumanized the worker. Charlie Chaplin described the result as, "Machine men, with machine minds and machine hearts." The very concept of an employee came from the Factory System period of 1850-1970, which not so subtly turned employees into "stuff". The factory system needed people to run the machines, but the less human they acted and the more they resembled machines, the better the system worked. We've left the machines behind, but it's still convenient to see people as "stuff", as extensions of machines. When you search the thesaurus for synonyms for "employee", some of the more disturbing synonyms listed are things like "slave", "cog", "hand", "hired gun", "desk jockey", "hireling", and "working stiff." What we call people at work doesn't have a respectable history. With that legacy in hand, it's very easy to see how we got here. A common definition of racism is, "prejudice, discrimination, or antagonism directed against someone on the belief that one's own race is superior." When we refer to people at work as "head count", "cogs", "work force", "capital", or as a "resource", we conveniently reduce them to something inferior and less human. We did this to people for centuries to enslave them. Doing it to people to dehumanize them at work is nowhere near as egregious, but it is built on the same principles of false superiority and inferiority. If we don't have to see people as fully human, it makes it easier to make decisions that negatively impact them. ...And the most subtle and insidious of all, "human resources", which reduces people to the level of a chair, computer, forklift, or other business resource. All of these terms make it easier to see people as "cogs in a wheel", allowing us to make decisions without as much regard for the individual human beings involved. As with most legacy terminology, we don't think about the roots of such terms and usually don't mean to use them pejoratively. But words are powerful and communicate; or with repetition, actually determine what we really believe. So let's ban terms like these that make people seem less human, and that are worn out in exhaustion in our time. We can do better. If you have a Human Resources department, it's time to change the name to something that emphasizes humanity and deemphasizes people as a resource. The very existence of such a department might be a related problem we can talk about in another post. I'm not human capital, or a human resource. I'm a human being. Going forward, please refer to me that way at work. By Bill Tucker, contributor at Forbes. Vortex Bladeless is a radical company. It wants to completely change the way we get energy from the wind. Think wind stick instead of a massive tower with blades that capture blowing winds. Wind stick. Really. Lest you think I’m mad, I’ve included a picture of this bladeless generator that helps with the visualization and explains the company name. See? There are no blades. What that “stick” (the company prefers, mast) does is capitalize on an effect of the wind which has been a very serious problem for architects and engineers for decades. When wind hits a structure and flows over its surfaces the flow changes and generates a cyclical pattern of vortices at the tail end of the flow. This is known as the vortex shedding effect which creates something known as vorticity and that is what Vortex Bladeless uses to generate energy. For those who need a explanation that exceeds my ability to fully explain, check out this link from Columbia University on the subject and then come back and join the rest of us who won’t wait for you. (you’re clearly ahead of us anyway) If you are still here with me, the company likes to give a classic example of vorticity that is immediately understandable; the collapse of the Tacoma Narrows Bridge that came apart three months after it opened in 1940. This clip posted on YouTube from a film made as the bridge undulated, wavered and ultimately shows the very dramatic effect of vortex shedding. Powerful stuff. Engineers immediately changed the way they designed and built bridges as a result of this incident. What the engineers at Vortex Bladeless are doing is embracing this effect instead of avoiding the aerodynamic instabilities to capitalize on the oscillation and therefore capture the energy. The mast is designed to oscillate in the wind (which is very different from Blowing in the Wind). As you can see in the picture above, this is not your usual wind turbine. It consists of a fixed mast, a power generator that has no moving parts which come into contact with each other and a semi-rigid fiberglass cylinder. The power generator is a system of magnetic coupling devices which means there are no gears needing lubrication and an overall system needing less maintenance. According to David Suriol Puigvert, one of the company’s co-founders (there are 3), the costs of a Votex system are dramatically lower than traditional wind turbines. The company publically claims maintenance costs that are 80% below a traditional wind turbine with manufacturing costs that are 53% lower. The lower maintenance & manufacturing costs add up an estimated lower cost per kilowatt. In addition to the lower carbon footprint of a wind turbine, Vortex claims even further reductions. Because there are no spinning blades, no birds are caught up and sent to their deaths in the name of greener energy. And the lack of blades means something else; much lower noise. Did you know there is a bi-annual conference for the purpose of resolving noise complaints from the large utility-scale turbines? I didn’t. Having driven by large wind farms in the mid-west I can say that I never noticed a problem yet it’s good to know a lot of attention is being given to the issue. The fly in this very cool ointment is that the technology is a proven concept and is currently is being tested and fine tuned in the field. This means we are about a year away from the reality of Vortex generated electricity. Initially, the co-founders were looking at large generating devices. That remains a longer-term goal but a much shorter range goal is a device of 4kW Vortex that would be about 13 meters tall (40’) and weigh about 220lbs. The company sees this generator being used in conjunction with solar generation for homes that are either off the grid or want to be off the grid. They are also developing a 100W device that will stand about 3 meters (9’) tall weighing about 22lbs. It is named the Vortex Atlantis and the company believes it can be used in off-grid areas to bring power to third world/developing villages where power could be a matter of life and again, used with solar generation. Those devices are forecast to be on the market in roughly a year.A 1MW generator is currently forecast to be about 3 years from market. Just a quick word about the company before wrapping up. Vortex is a Spanish tech start-up. Its funding, so far, has come from a Repsol Foundation Grant, a loan from the Spanish Government and venture capitalists in Spain (Spanish Angels). In February of this year, Vortex Bladeless relocated to Boston. Here it is working with Harvard University, SunEdison, IDEO and is working with venture capitalists for its next round of Series A funding. Due to public interest in investing in the company, they will launch a crowdfunding campaign on June 1. As always, look before you leap. This is very exciting technology but let your brain guide your investing not your excitement. By Tim Smith If you’re anything like me, you live and breathe online, Tweeting your interesting thoughts, Instagramming your dinner, posting photos of your kid on Facebook. We’re living in a world where we have so much more than we’ve ever had right at our fingertips. So controlling your home with smartphone apps and automated systems is a no-brainer — this technology makes life easier and takes the headache out of many common tasks from vacuuming to flipping on light switches. This device allows you to control the heating and cooling settings remotely, with programming for weekdays, weekends, and individual preferences. If your schedule changes each week, this is a great product for you. The initial costs are more than made up through energy savings throughout the year. The CWA2000 detects motion in your business, your home, or your yard, and it can be installed for indoor or outdoor use. It has adjustable sensitivity control and can be adapted for up to eight sensors. With a 120 degree wide sensory ability, it detects movement at up to 30 feet. Are you concerned with home safety while you’re away? This package contains one camera, for outdoor use, and can be programmed to take live video or a snapshot. Additional cameras can be added if desired. This equipment is available through AT&T. The technology for robotic vacuuming continues to improve. The newest Roomba model, the 800 series, uses an AeroForce Performance Cleaning System to pick up 50% more dust, debris, and dirt, with very little maintenance. The newest Roomba sells for $599.99, and the basic iRobot Roomba Model 560 starts at $199.99. You can turn your lights on — or off — from anywhere in the world using your smartphone, iPhone, or iPad. This controller replaces a standard light switch and works through your Wi-Fi system. This is simple enough for most DIYers. Take advantage of the technology at your fingertips, and save time and money through the use of automated systems. For more home automation ideas check out Modernize.com. OK, so you're building the business of your dreams. But do you have any reference point for how your business actually affects you personally? If you don't, you just might be building a trap for yourself, not the business of your dreams. If you don't have a handle on the Seven Stages of Business Ownership, you're likely to flame out personally, even if your business is successful. Will You Be Owned By Your Business? Just about every business founder/owner makes the mistake of assuming that if they build a great business, they'll automatically get a life, too. Big mistake. If you're building a business, you need to be as intentional about eventually getting a life as you are about building the business. Building the business always comes first, but if you don't intend to USE your business to build your ideal lifestyle, you won't own the business; the business will own you. 2) What stage is my goal? You can stop anywhere from Stage Five through Seven. But if you stop at Stage Four, which most business owners do, you will always be a hostage to your business. Stages One through Four are about generating money. Stages Five through Seven are about ensuring your business generates both time and money for you. Get to at least Stage Five so you can have both. Pouring time and ideas into creating the business & getting it off the ground. This is fun! Stage Two--Survival Survival is everything; funding is drying up. Urgently driving sales. We burn a lot of fuel on takeoff. I didn't think it would be this hard." Stage Four--Stability (& Growth)Regularly profitable, finally. The "American Dream! ", followed in a few years by quiet desperation. Outwardly successful, inwardly deflated. My business owns me." Stage Five--Success Now others can "make the chairs." The business makes money when I'm not around and I don't have to stitch it back together when I return. Only 5%-ish of business owners ever get to Stage Five. You can make millions and be stuck in Stage Four for decades because you have no time to enjoy the money. The reason only 5% make it? The Big Mindset Shift. They decide to demand that their business give them BOTH time and money, not just money. It's that simple. "I'm off the treadmill!" Stage Six--SignificanceLeadership inplaceThe owner is about vision and guidance, not production. "I'm focused on making a difference, not making a chair." Stage Seven--SuccessionLeadership incharge. The owner delegates guidance and focuses on vision, passing the day2day torch of leadership to others. They become "the myth"--when they walk in, people whisper, "Hey, that's the person who started it all." Leadership--"I used to solve and decide. Now I ask questions." Beware Stages Four and Six Stage four is the most dangerous stage. The urge to escape any future risk to get to the next stage keeps us on the treadmill for years, if not decades. But stopping at this stage ensures you bought a job, not a company, and will ensure you regularly fall back into Stages Two and Three. Stage Six is the second most dangerous stage. If you go off and "play" too quickly at this stage, you will come back to a disaster. Focus for just a little bit longer, and make sure someone else is giving day-to-day guidance, and reporting transparently to you. Which Stage is Your Objective? Where are you? What's the one thingyou need to donowto get to the next stage? There's a hundred things you could do; just do the next one. If you can't get past Stage Four, it's head trash. Nobody is as good, competent, experienced, committed, etc. You made that come true. Stop it. If you're in Stage Five or greater--congratulations--take the next month off with pay. They won't miss you! Inspired by our partnership with KNUS for Leadercast 2015, the Colorado Business Roundtable is proud to identify brave Colorado leaders by launching our own Brave Leaders series. Each week, we will talk with one of our nominated #BraveLeadersCO about their perception of bravery, and who exemplifies those qualities to them. Listen for the Brave Leaders series every Saturday on 710KNUS in the final half hour of Connect & Collaborate. Our Brave Leader this week is former Governor Bill Ritter, now director of the Center for the New Energy Economy (CNEE) at Colorado State University. Governor Ritter will share his thoughts on leadership and risk, and tell us about the man who inspires him. Ritter found inspiration in his years as Denver District Attorney, from fellow D.A., Philip Van Cise who fought corruption among the corrupt, in Denver at the start of the roaring 20s. We also have guests; Steve House, Chairman of the Colorado Republican Party and Bill Schilling, president of the Wyoming Business Alliance. Steve House tells us about his journey from business and healthcare, to a gubernatorial campaign, and ultimately, his current position with the Colorado Republican Party. Bill Schilling shares the Wyoming Business Alliance's efforts to bring about real conversation about business and economic development to business leaders in each county in Wyoming as a part of Tour 23; a series of four hour meetings throughout the state. Daimler Trucks North America is the first to get approval for self-driving commercial vehicles in the United States. The Freightliner Inspiration Truck, and other trucks like it, could have massive implications for the future of transportation. 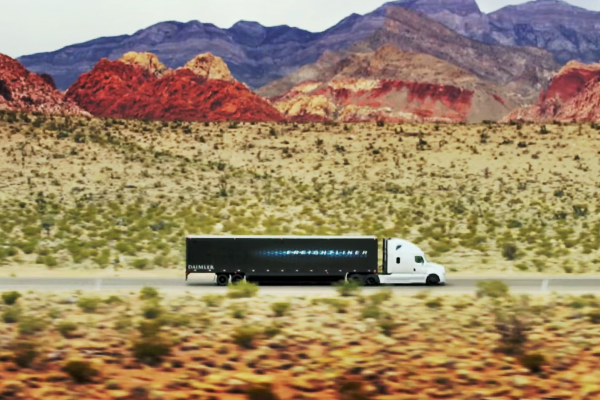 The Inspiration truck features a system called Highway Pilot, which uses stereoscopic cameras and radar sensors to give it an autonomous autopilot mode when cruising on the highway. The truck can steer to stay between lane markers and adjust its speed and braking to maintain a safe following distance behind other cars on the road all while the driver is free to do other things. It’s considered a “level 3” autonomous vehicle, meaning it enables hands-off highway driving under certain circumstances, but requires a driver to be present, ready to take the helm in an emergency or to pass other vehicles in the truck’s path. The driver is likewise required to assume control of the vehicle when exiting the highway, driving over local roads and pulling up to the loading dock for making or taking deliveries. For the record, a “level 4″ vehicle would be able to perform all driving functions and monitor roadway conditions for an entire trip, truly freeing up the valuable resource of human time. Daimler executives are being careful to allay fears of human employment disruption. “We don’t want to get rid of drivers,” says Sven Ennerst, head of Daimler Trucks’ development department. Daimler continues by repeatedly saying the technology won’t can’t change lanes on its own, it won’t be market-ready for a decade, and could never fully replace human drivers. The reality remains that that it is a big step towards addressing a massive market need: safe and reliable transportation. Some large freight carriers have already started incorporating innovative new safety features like blind spot monitoring, adaptive cruise control, and lane departure warnings. The economic case for these technologies is clear. With America's driver shortage continuing to worsen, good truck drivers cost more these days. Costs are also rising for companies that cut corners and hire unsafe drivers. Liability in a commercial truck accident is increasingly falling on the shipper. In order to get the autonomous vehicle license plate from the state of Nevada, Daimler needed to prove the system could safely cover 10,000 miles on its own. This was done on test tracks in Germany and on quiet roads in Nevada. Daimler ran a small study (16 drivers on a test track) to see how this autonomous system affects drivers. EEG readings showed they were 25 percent less tired than they were when they had to steer themselves. It takes an act of bravery just to start a business, to take a risk to grow that business, or putting everything on the line to do the right thing, no matter what your career ambition. That's precisely what we at Connect & Collaborate seek to celebrate with every business leader we introduce you to each week. In our Pro-Business Colorado Edition, Dave Tabor of the Colorado Association of Commerce and Industry (CACI) introduces us to Susan Cirocki, President and Owner of Arrow Sheet Metal Products Company, and Chris Cumpton, President and Owner of Integrity Electrical Solutions. Besides owning and operating their businesses, Susan and Chris are married - to each other- giving them a unique perspective on running small businesses and managing their own relationship. One advantage is having a built-in business consultant who really understands your business, though they admit they limit their work talk after 7:00PM for the sake of their marriage. In our interview, they share more insight on business and beyond. Speaking of bravery, we proudly bring you the first in our Brave Leader series, inspired by Leadercast and this year's theme, The Brave Ones. The Colorado Business Roundtable wanted to take it a step further, and honor Colorado's brave leader through our #BraveLeadersCO campaign. 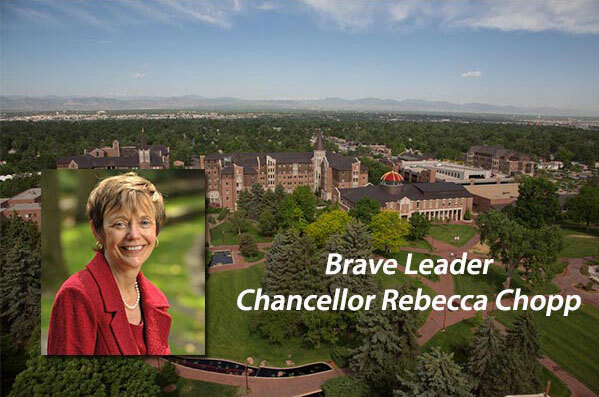 Kicking things off for us is University of Denver Chancellor, Rebecca Chopp. A brave leader herself, she cites Daniel Ritchie as her inspiration. We know you'll love her story. Tell us about your brave leader! 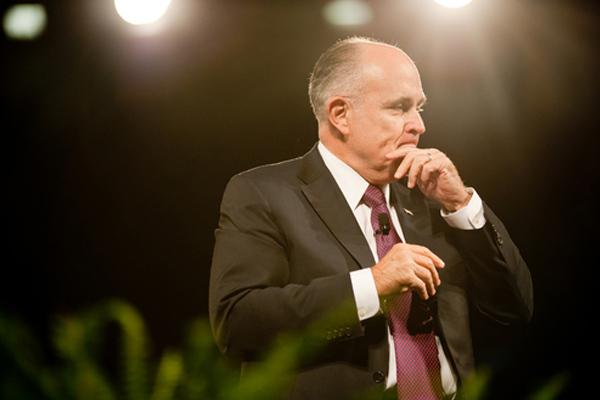 Rudolph W. Giuliani is the former Mayor of New York City. After joining the office of the United States Attorney for the Southern District of New York, Rudy Giuliani rose quickly through the ranks, becoming the Chief of the Narcotics Unit at age 29. After the inauguration of Ronald Reagan in 1981, Giuliani was named Associate Attorney General, the third highest position in the U.S. Department of Justice. In 1983, President Reagan appointed Rudy Giuliani as the United States Attorney for the Southern District of New York. Giuliani spearheaded successful efforts against organized crime, white-collar criminals, drug dealers and corrupt elected officials. Few U.S. Attorneys in history can match his record of 4,152 convictions with only 25 reversals. In 1993, Rudy Giuliani was elected Mayor of the City of New York. He focused on reducing crime, reforming welfare, and improving the quality of life and was re-elected in 1997.Under Mayor Giuliani’s leadership, overall crime was cut by 56%, murder was cut by 66%, and New York City—once considered the crime capital of the country—became the safest large city in America according to the FBI. Mayor Giuliani also implemented the largest and most successful welfare-towork initiative in the country, turning welfare offices into Job Centers and reduced welfare rolls by 640,000—nearly 60%. 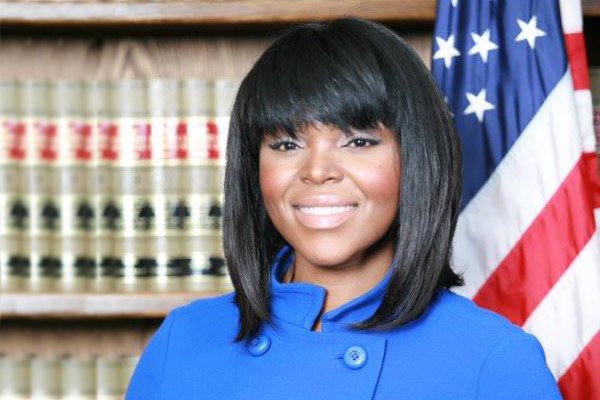 On June 4, 2013, Aja Brown made history as the City of Compton’s youngest elected Mayor at the age of 31. With over 10 years of experience in community and economic development, Mayor Aja Brown has proven to be a strategic visionary concentrated on improving outcomes through policy reform, innovation and strategic partnerships, proudly serving the citizens of Compton. Since induction, Mayor Brown has made major strides in improving the quality of life for Compton residents and stakeholders alike. Mayor Brown has launched several community initiatives including the “Compton Community Policing Task Force,” a network of law enforcement agencies and community activist that implement gang intervention and prevention strategies, tackling complex social issues such as human trafficking head on. Mayor Brown has received the prestigious University of Southern California 2014 Young Alumni Merit Award, participated as the 2013 Pat Brown Institute Distinguished Lecturer, is the recipient of the National Action Network Martin Luther King Award and is a strong advocate for youth, women’s rights and equality. Mayor Aja Brown’s bold brand of leadership is turning the tide in one of America’s most troubled cities. OIL AND GAS INDUSTRY UPDATE The lower energy price environment is affecting new production and may be dampening broader economic growth in Colorado. Our contention remains that lower energy prices are a net negative to the Colorado economy since the state is a top 10 producer of both oil and gas. The severity of the dampening depends on the duration of the low price environment. Counties with significant industry production and employment will experience the greatest impact, but economies that participate in the supply chain will also be impacted. The energy economy of 2014 and 2015 looks vastly different than even three years ago. A lag is observed between prices and economic activity. Oil and gas prices recorded a precipitous decline in 2014 that has extended into early spring 2015. As of mid-April, the West Texas Intermediate (WTI) spot price was 49% below the June 20, 2014, peak. Prices are 38% below the five-year average. Price volatility has stabilized compared to three months ago. The WTI has now recorded 10 months of yearover-year declines. Drilling permits and starts are down for the first three months of 2015 year-over-year in Colorado, and the rig count is down more than 40% year-over-year. Natural gas prices are also off peak from 2014, down 44% in April. The average monthly price topped out at $6.00 per million BTUs in February before falling, to $2.63, in April (as of April 15). The impact of gasoline prices is readily observable to consumers. Prices topped $3.71 per gallon on August 18, 2014, before falling 48%, to $1.93, in Colorado on January 19, 2015, according to the Energy Information Administration (EIA). 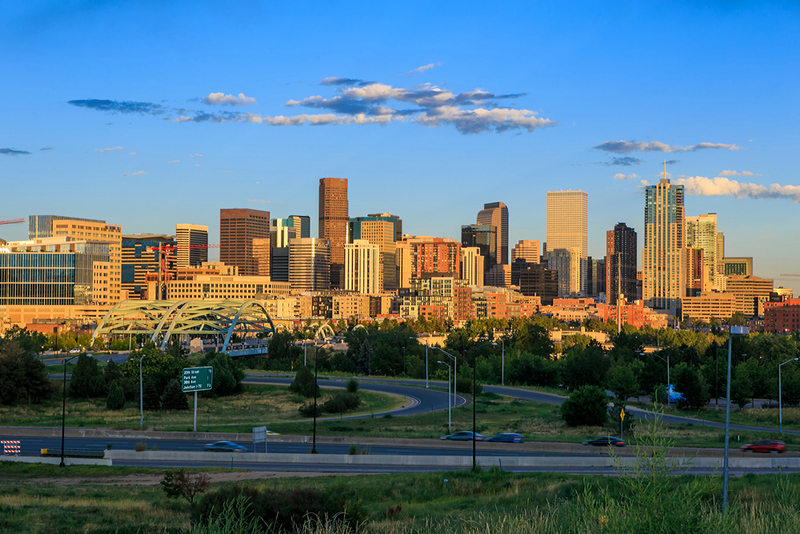 Despite prices rebounding 25%, the average in Colorado of $2.41 on April 20, 2015, remains 34% below the same period a year ago, and 30% below the five-year average. The Mining and Logging industry lagged the state entering the recession and led the state in its recovery. Employment in the Mining and Logging industry in Colorado is made up of mostly oil and gas workers (~80%). The industry continued to add jobs in 2008, a full eight months after the recession took hold on total employment in Colorado. However, the Mining and Logging industry quickly shed jobs as well, losing one-quarter of total employment in 12 months. As of March 2015, the industry was 18% above 2008 peak employment compared to 6% for total employment in the state. Colorado’s oil and gas industry has changed dramatically over the past 10 years. In 2004, the value of natural gas production eclipsed oil production nearly 7 to 1, and the epicenter of Colorado energy production was in the gas-rich fields of La Plata, Montezuma, and Garfield counties. Garfield and Weld counties jockeyed for the top position in the number of drilling permits each year. The DenverJulesberg Basin quickly rivaled new drilling in the Piceance and San Juan basins. In 2014, oil production in Colorado totaled an estimated 93 million barrels, growing by 28 million barrels from 2013 (which is more than the total production in 2007). Natural gas production in 2014 was 9.2% below the 2011 peak. During the last major price event in 2009, extraction jobs remained stable and pipeline transportation jobs increased (13%), but drilling (-49%), support activities (-19%), and pipeline construction (-27%) jobs decreased sharply. Industry wages declined by $604 million in a single year. However, employment rebounded strongly and led the state in the employment recovery following the recession. While lower prices are a boost to the consumer (income effect), the downside risk of these lower prices is that Colorado’s energy economy slows, dragging down some of the strong growth that the state has benefited from postrecession. The energy industry pays above-average wages ($104,626 in 2013) and employs almost 34,000 workers upstream and midstream (30,000 employees, 4,000 sole proprietors). While many of these workers may not be affected by falling prices, the exploration and drilling jobs are among the first to be impacted. Monthly data through March show seasonally adjusted Mining and Logging employment decreasing month-over-month for the last two months, and the pace of growth slowing to 8.9% year-over– year, the slowest pace since February 2014. Modeling the impact of lower oil and gas prices on the state economy, state GDP grows at a slower rate, but the impact of the lower prices is not recessionary. Total employment grows 1.1 percentage points slower in the state due to the oil price decline in 2015, but employment grows faster in 2016 and 2017 as oil prices rebound above $80 per barrel. Seth Godin is the author of 17 books that have been best-sellers around the world and have been translated into more than 35 languages. In addition to his writing and speaking, Seth Godin was founder of Squidoo.com, a leading site recently sold to HubPages. His blog is one of the most popular in the world. Before his work as a writer and blogger, Godin was Vice President of Direct Marketing at Yahoo!, a job he got after selling them his pioneering 1990s online startup, Yoyodyne. In 2013, Godin was inducted into the Direct Marketing Hall of Fame, one of three chosen for this honor. Any business idea is only as good as the subsequent marketing idea that helps it get noticed. 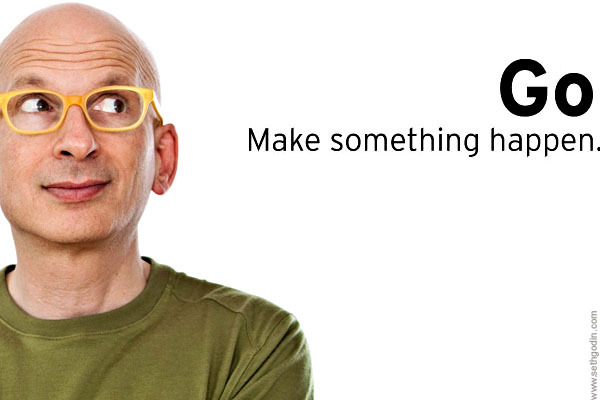 Seth Godin has developed into one of the foremost authorities on ideas of marketing, innovation, and creativity. He’s sold millions of books, 17 of which have been bestsellers around the world. He’s launched multiple companies, and has turned the publishing industry on its head by launching his latest book series via Kickstarter. Godin knows that the best leadership, and the best marketing ideas come from ordinary people who put in the work required to discover the greatness inside of them. 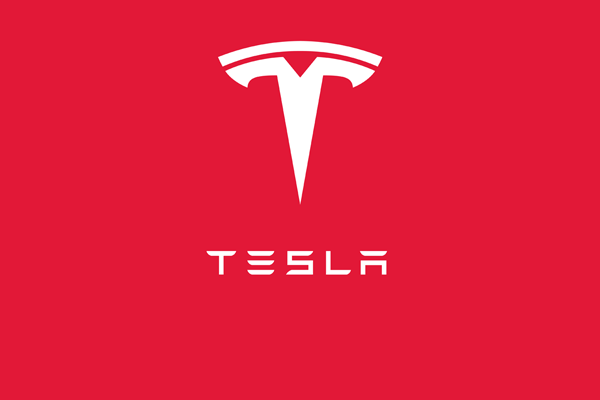 Tesla Motors is expected to announce a new product later this week: Residential and Commercial Battery Systems. It's clear Tesla is expanding its close partnership with Panasonic, the world's largest manufacturer of Lithium Ion Batteries, through the upcoming Gigafactory plant in Sparks, Nevada. Investors and Tesla advocates immediately speculated that the new product line would be a battery system. The new product and business model were originally alluded to by founder Elon Musk on his twitter account. While formally being announced on April 30th, Tesla seems to have confirmed this reasoning through a letter to investors. The letter confirmed a "home battery" and a "very large utility scale battery." There is intriguing business genius with this move. The company is planning on scaling up battery production with the aim to achieve massive economies of scale. Designing a high potential battery product for homes and businesses could help create demand and expand its market position into the electric utility world. For the customers, it makes economic sense to buy and store electricity at night when the price is low. The system could even sell unneeded electricity back to the grid when prices are high. Widely implemented, systems like these could help the expansion of renewable energy sources that provide power intermittently when the sun shines or the wind blows. Around 300 customers have already installed Tesla's batteries in their homes, reports The Guardian. "It’s clean, it’s quiet and it looks good in the garage," investment analyst Trip Chowdhry told the newspaper, adding that the system appeals to customers who want a constant connection to the internet. "If you are a gadget person living a digital life — you have iPhones and computers and you always want to be connected — the storage battery is a dream come true." Helping businesses to do business better. That's the goal of almost any chamber of commerce. The Parker Area Chamber of Commerce does this better than most, by scheduling great events and speakers to inspire and encourage their members. Dennis Houston, President and CEO of the Parker Area Chamber joins us to discuss their efforts to serve northern Douglas county, by monitoring and influencing relevant legislation, while also building a calendar of fun events. One such event is slated for May 5th, as PACC invites Marketing Strategist, Kyle Sexton to speak talk about Social Media for Business. 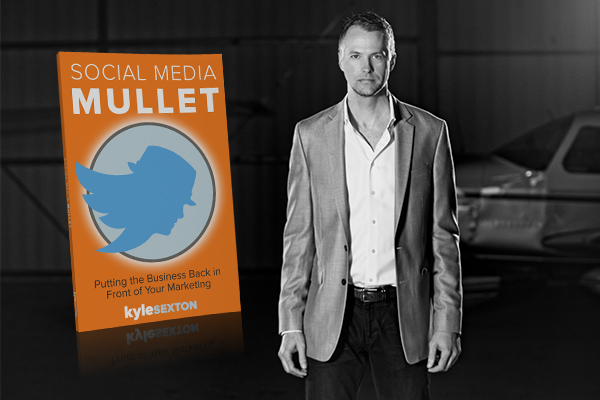 Kyle is an expert on incorporating social media with business market, and is the author of soon to be three books. The latest title will release this summer, Social Media Mullet. Kyle joins us for a preview of the event, his thoughts on strategy and a sense of humor about the whole thing. You can still register for the event on May 5th, 8:00 to 11:00 at the PACE Center. Click here for registration details. Later in the program, we continue our series of interviews with our state legislators, featuring Representative Rhonda Fields of District 42 in Aurora. Rhonda tells us what led her to her work at the capitol, and which bills she working to pass, including: Advanced Practice Nurse Prescriptive Authority (SB 197) which would allow nurses in under-served areas to write prescriptions, Interactive Electronic Harassment - Cyberbullying (HB 1072) which would help eliminate loopholes to ensure that anyone harassed through social media or electronic means has recourse, and No Detention for Truancy (SB185) which would remove the juvenile court's jurisdiction over truancy, and several other bills.